Are you a designer with a desire to inspire? Besides the invaluable role in translating design concepts, moodboards are so much fun to create! You know that feeling when you finish the design and can’t wait to show it to the world? No matter if you are a beginner or a professional, sharing your ideas helps both you and others get better. SampleBoard swore an oath to empower designers to create a better world through creativity. That’s why we are here to put your best concepts in the spotlight of design community (and give you a little something for being a good Samaritan). You can submit as many moodboards as you wish. We will go through all of them and announce the winner at the beginning of the following month. 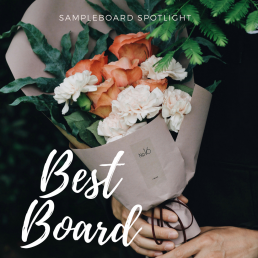 The best board will be published on the blog with a shout out about you and your work (that’s why we need you to complete the step number two) and will be shared across our social media profiles (Facebook, Pinterest, and Instagram). Make sure to follow the feeds, so you don’t miss the announcement. Not only will you get many curious eyes on your work, but you will also receive 1 MONTH FREE MEMBERSHIP on SampleBoard. It doesn’t matter if you’ve just discovered SampleBoard or we’ve been in love for a long time, all we are looking for are inspiring concepts. You can even register for a free trial and still participate in the giveaway.